This 5 x 7 Photo Holder Is For Sale Online At A Low Price! In-Stock Units Usually Sells Out Fast. 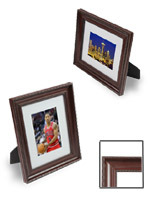 Purchase This 5 x 7 Photo Holder At A Low Price from This Website. Metallic gold finish coordinates with just about any settings. Removable matting for displaying 2 different size prints; 5" x 7" or 8" x 10". Made from polystyrene plastic that is less expensive than wood or metal. This 5 x 7 photo holder is a perfect substitution for more expensive plastic or wood frames! 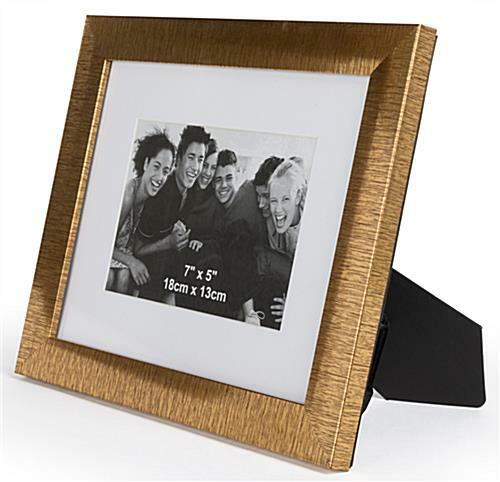 Treasure your significant snapshots by encasing them in this inexpensive plastic frame. This photograph display, 5 x 7 photo holder features a metallic gold border that will add an upscale appearance to your images. The fact that this picture frame is made from polystyrene, and not wood or metal, makes it very affordable. 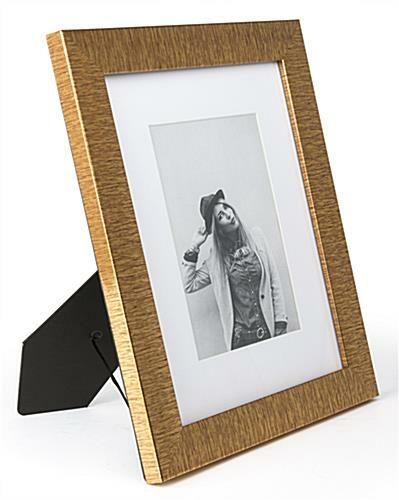 This gold 5 x 7 photo holder that has a plastic profile is inexpensive, but has the look of picture frames that are made from real wood. So why spend more to purchase an expensive frame when shoppers can get this plastic frame at a lower price? 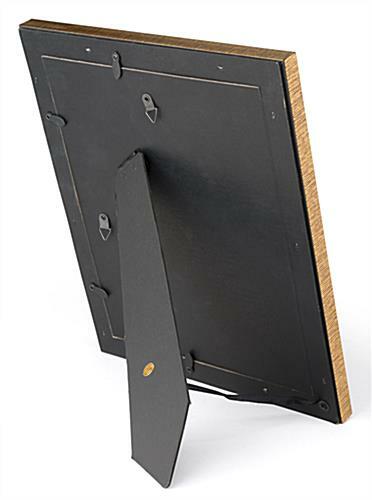 Each unit comes with a two-way easel backing as well as a two-way hanging capability. 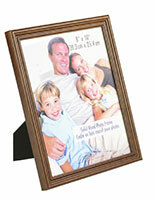 This 5 x 7 photo holder that has an easel backing can be used to present a vertical or horizontal style image. 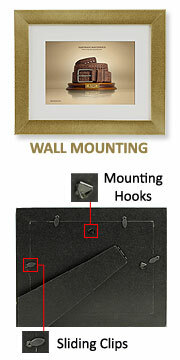 Users exhibit the frame on the countertop or mount it on the wall. 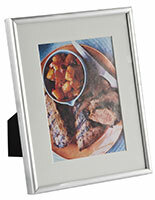 A matted 5 x 7 photo holder, such as picture frame, is designed to accommodate 5" x 7" prints. 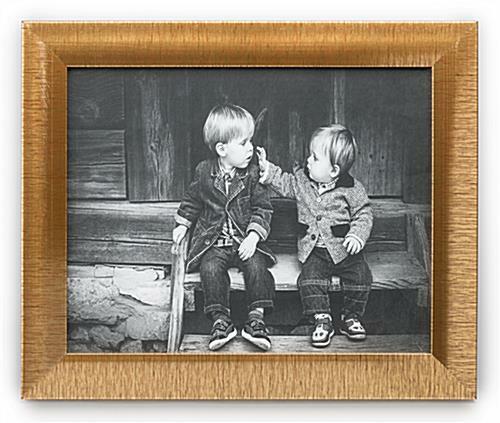 However, users can also remove the white matting for displaying a larger size 8" x 10" photograph. This 5 x 7 photo holder that comes with removable white matting can be used to show pictures of your friends, families and visitors. 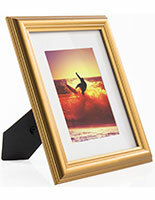 Users can also display inspirational cards or artwork in the framing. 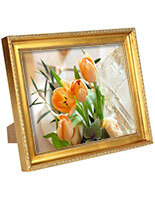 This picture frame, 5 x 7 photo holder is great for use in homes, offices and retail stores. The image display is compact enough for placement on a bookshelf or piano top without taking up too much space. 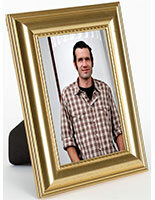 Retailers can use the picture frame to display advertisement cards. 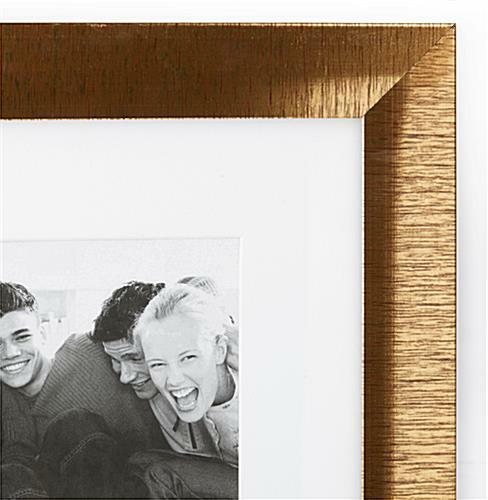 This gold finish framing also makes a great gift. A front glass panel is provided to protect your precious pictures from getting unwanted dust and damage. This picture frame permits fast and easy changes! Simply slide the clips to the side, place the graphic behind the glass lens, rest the black backer behind the image and your photograph will be ready to be displayed! This picture frame is available for purchase in bulk quantities. Purchase this image display online for more savings! 8.3" x 14.5" x 0.625"